The project is a mediation between service architecture to the city and landscape. The location of project area , in fact, offers the possibility to increase the principal characteristics of the area without changing the urban planning and the uses of the citizens. 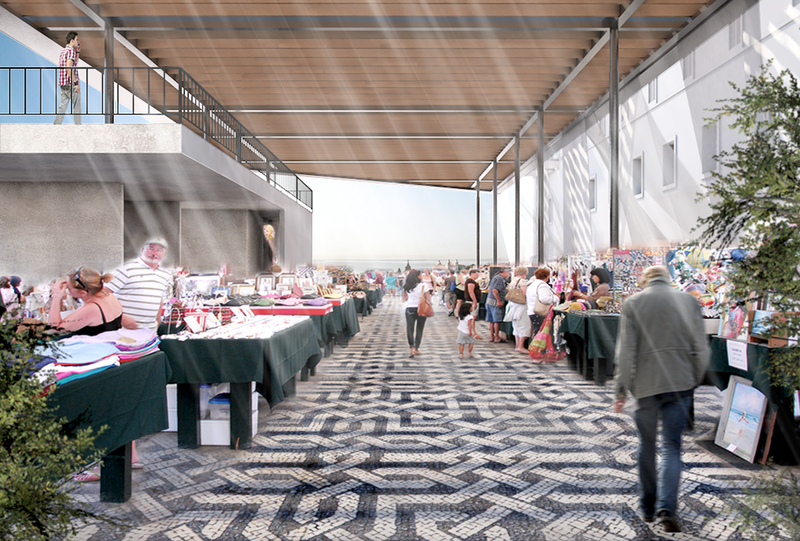 Two are the typical elements of the city from which the project starts: the Feira da Ladra and the geographic position that offers a spectacular sight toward the sea. The wooden and steel coverage becomes, in fact, an ideal place to hold an extension of the market, giving a new function to the whole area, but, at the same time it holds temporary events like exibhitions or conferences. The architectural program is based on the concept of Social Plaza. Fot this reason we have a reception, a lounge cafe and services. A small open air theatre completes the offer of entertainment turning the concept of the plaza into a Performing Plaza. Finally, according to principal element of the project, the terrace, an observatory for the sea that changes the perception of the same area.